“Identity” as a theme, is one that has haunted many writers over the years. 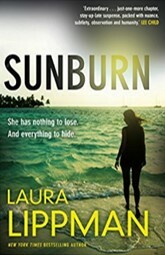 Sunburn as a slice of American Noir from former journalist, Laura Lippman explores ‘identity’ and who we think we are, as well as who we once were, and who we pretend to be. This crime-thriller though set in the mid-1990s, could have been set in the golden-age of American Noir back in the 1950s. Lippman’s preceding work Wilde Lake is a tough act to follow, but the new novel is extraordinary and even more engaging and unsettling for the reader. When the mysterious femme fatale Pauline / Polly apparently flees from her past arriving in Delaware, she meets (seemingly by chance) an equally enigmatic man named Adam. Soon these two strangers become something more, but there is something concealed, something hidden from view for both have secrets; one or both maybe running, or trying to find someone, or trying to escape? But from what, is the question the reader ponders upon. Sunburn is elegantly written with an intentionally measured pace. We follow the relationship of strangers Adam and Polly as summer turns to autumn, events take a few turns into the dark. The pre-millennial setting is evocatively realised and makes one pause, reliving those pre-internet days where coin-operated payphones sat on street corners, and our attention spans were under less pressure from the digital world of today. Intricately plotted, Lippman explores the world through these two people who keep aspects of character concealed in shadow, not unlike Lehane’s last novel, Since We Fell - except that in Sunburn the language of what appears presented as love, maybe something far more complex. Though like Lehane, Lippman’s characters reveal themselves slowly, unflinchingly and with contradiction, which at times makes the reader bristle with surprise, and also with shock. The peripheral characters are integral to the novel as they pepper the narrative like solid metal pitons hammered into a sheer mountain face; for they allow the reader hand, and footholds; insights into Polly and Adam’s lives and their motivations before they met in a Bar in Belleville, Delaware and seemingly feel in love. Hugely recommended as a thought-provoking and deeply unsettling summer read.